This sword is made of damascus folded steel, clay tempered with a polished mirror-like surface. It is a very strong sword made with traditional methods, for multiple applications. The blade has been repeatedly heat treated and hand forged to remove impurities. 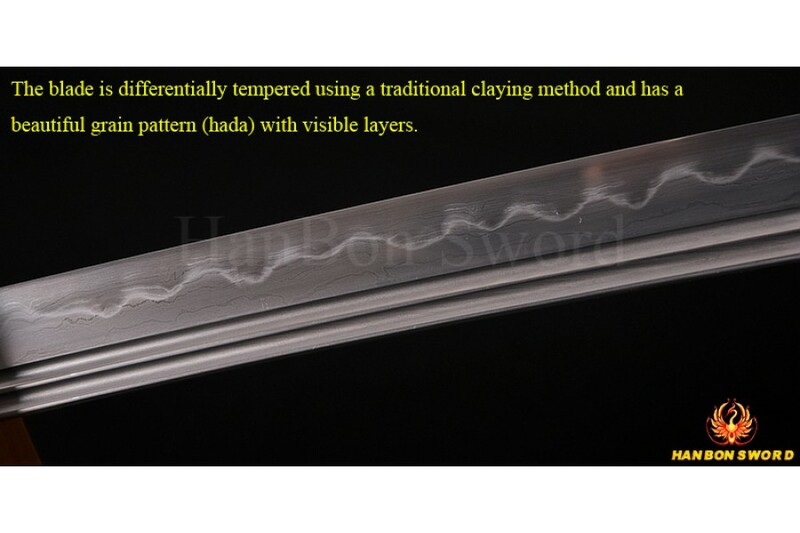 The clay temper process combines the characters of toughness and flexibility and results in a genuine hamon (temper line). The blade is full tang and hand sharpened, suitable for battle. The combination of the quenching and the clay cover creates a significant temperature difference in the Ha of the blade and the rest of the sword. The hamon is authentic all the way up to the tip. The blade has two long Hi (blood groove) on each side, This not only allows for a lighter blade and audible feedback when swung. but also can balance the blade to achieve optimal performance. It is strong enough to cut through a thick bamboo tree. The Habaki is a single piece brass construction fitted over a copper Seppa. 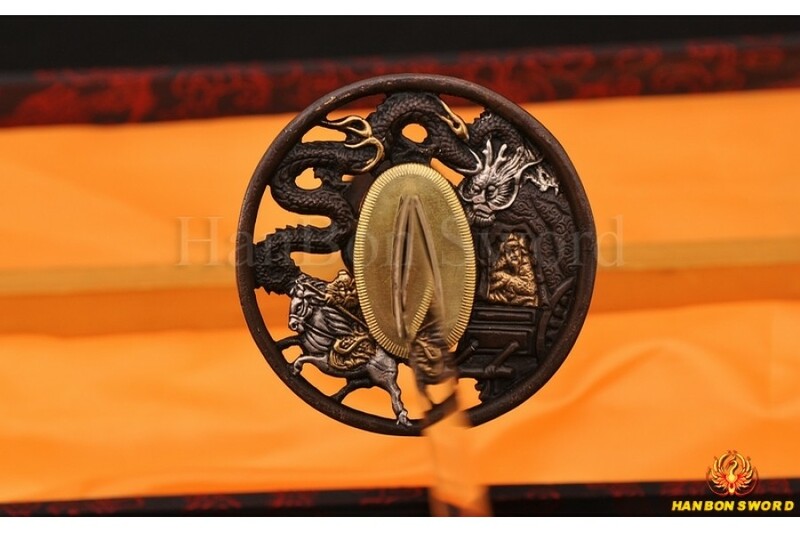 The Tsuba itself is brass with dragon design. Another Seppa secures the Tsuba to the Tsuka of the sword. The Tsuka is wood laid over the tang of the blade. Wrapped over the wood is a white ray skin Same, and traditional Japanese style katate-maki(battle wrap) black synthetic silk wrapped handle with real white lacquered samegawa, two bamboo mekugi secures the tang to the Tsuka. A dragon design brass menuki is found on each side of the handle. 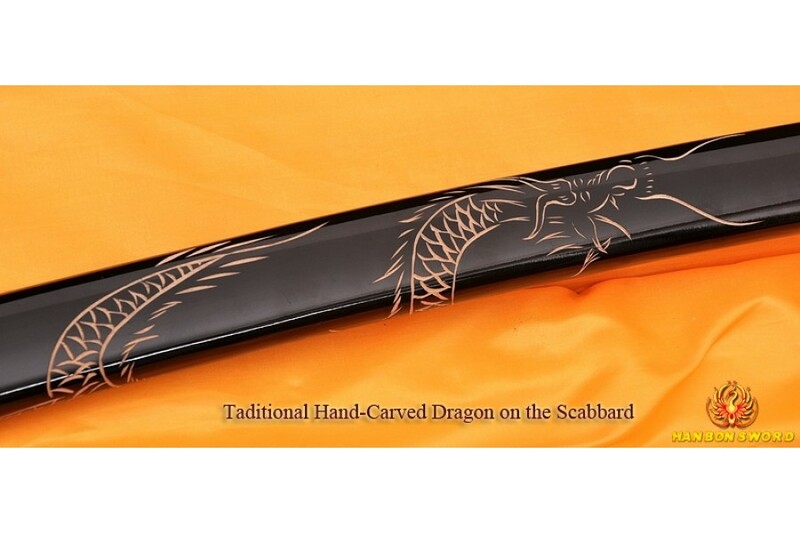 The saya(sheath) of the sword is wooden with a black high gloss finished and the saya has been hand craved a dragon pattern. 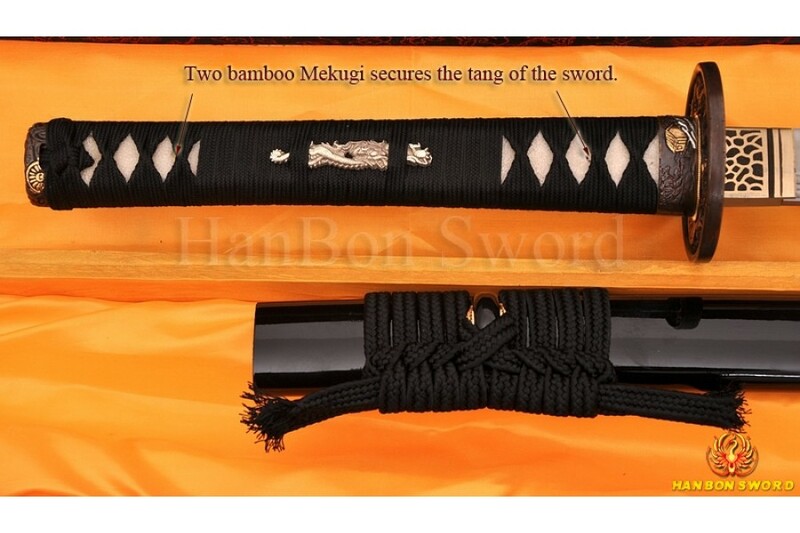 Black synthetic Sage-O has been tied around the bright copper Kurigaga (knob) of the scabbard. the Koiguchi has been hardened. 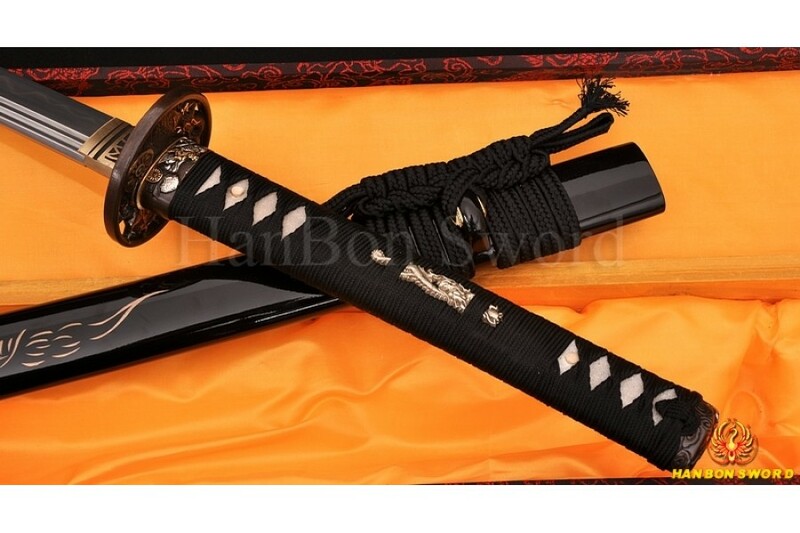 This is a sharpened, super, truly battle ready Samurai sword very suitable for iaido and kendo superior. 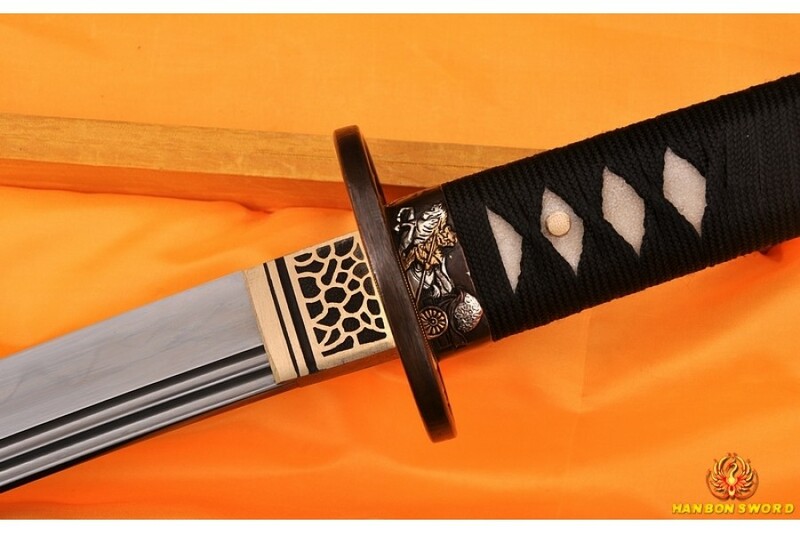 This Japanese Samurai Sword WAKIZASHI is made of damascus folded steel. it is fully functional and battle ready. The blade has been repeatedly heat treated and hand forged to remove impurities, it has been folded 13 times with 8192 layers, which cast flexibility and hardness of the blade in a large degree. The visible tenuous undulating grain on the blade was resulted from folded repeatedly during forging, and the clay temper process combines the characters of toughness and flexib.. 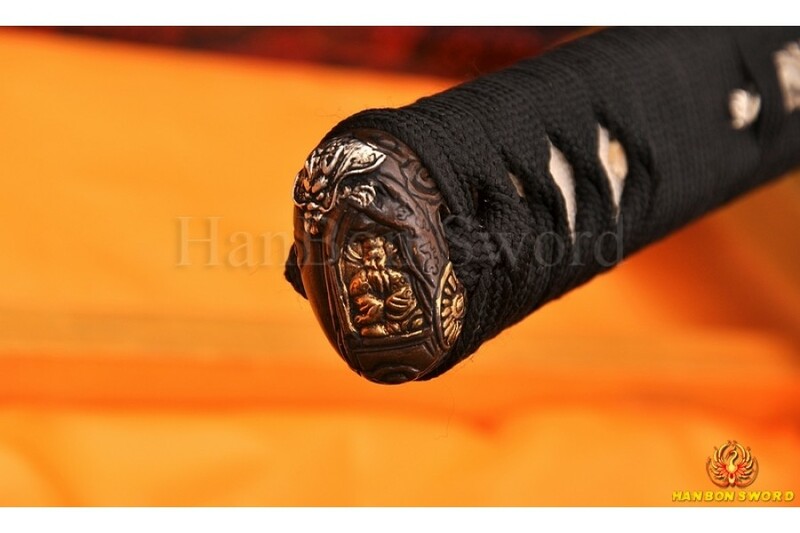 This Japanese sword Wakizashi has been hand forged using the ancient method of sword making. Full hand forged, hand polished and hand sharpened. 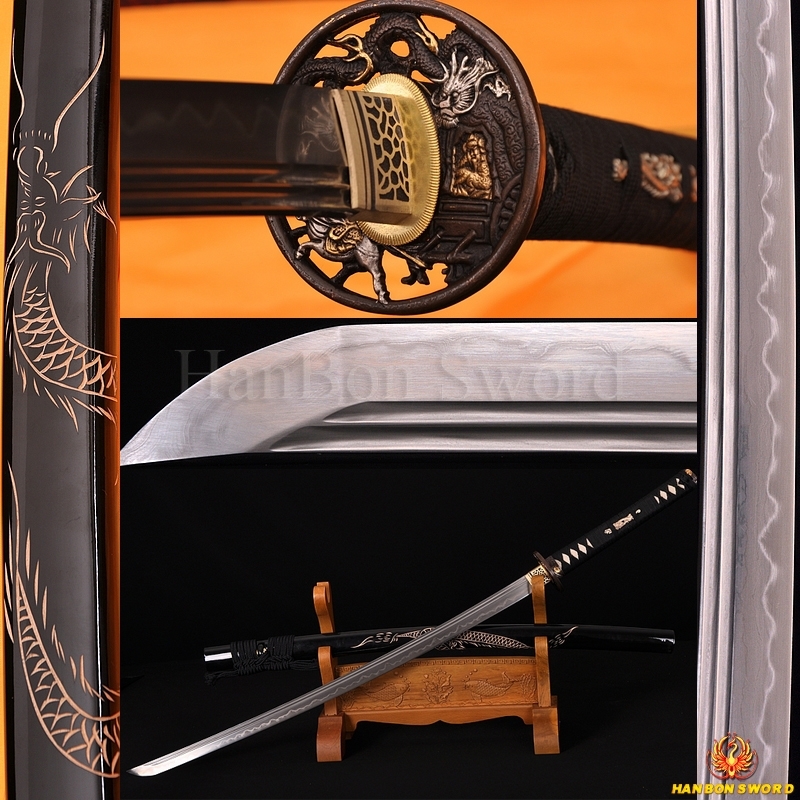 This sword is made of folded steel with 13 times folding to create the 8192 layers, which cast flexibility and hardness of the blade in a large degree. The visible tenuous undulating grain on the blade was resulted from folded repeatedly during forging. The clay temper process combines the characters of toughness and flexibility and results in a genuine.. This Japanese Samurai Sword Katana is made of damascus folded steel. The blade has been repeatedly heat treated and hand forged to remove impurities, it has been folded 13 times with 8192 layers, and it has been hand polished with multiple grade sharpen stone by Japanese method, which made the surface of the blade like a mirror. The clay temper process combines the characters of toughness and flexibility and results in a genuine hamon (temper line). The combination of the quenching and the clay .. This TANTO is hand forged and hand sharpened using Japanese methods to create a perfect blade. 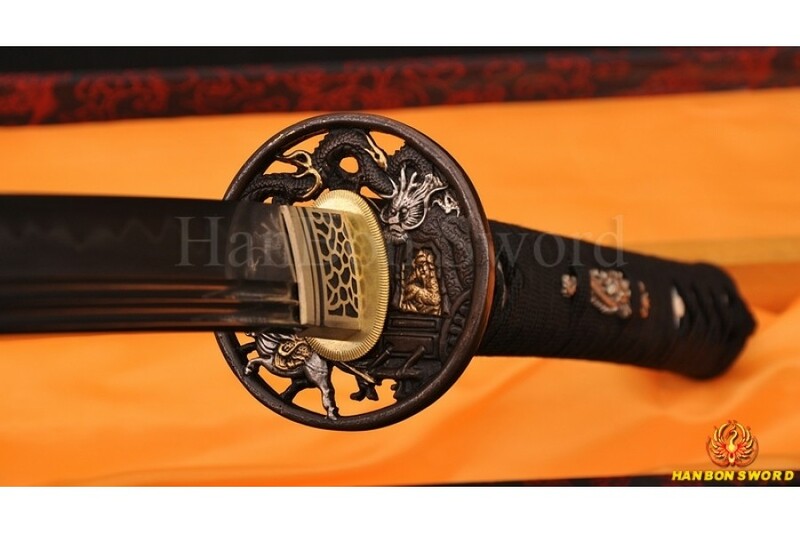 The blade of the sword has been made of 1095 high carbon steel, and it has been laminated in Maru style with a clay temper line. The blade comes with full tang and a chu-kissaki. The steel has been throughly refined and tempered, a special clay is applied to the blade by hand, using a thin covering near the edge and a thicker layer over the rest of the blade. This results in a relatively quicker coolin.. 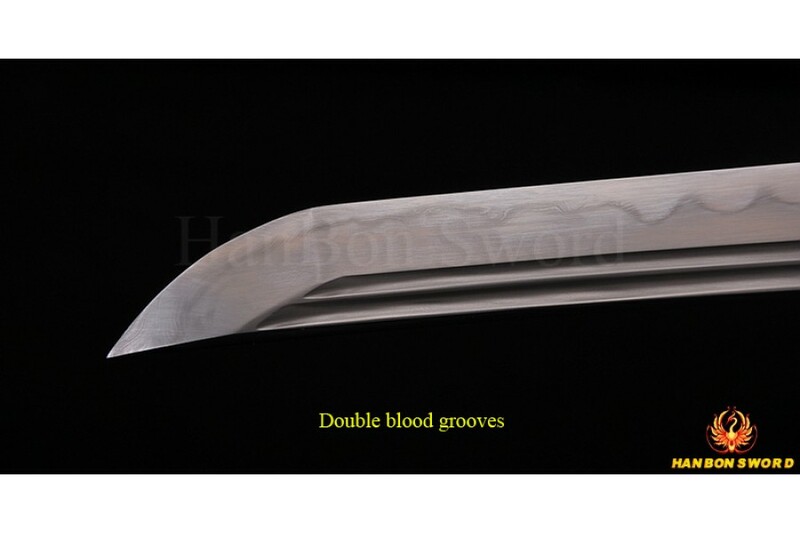 This japanese samurai sword katana has been oil quenched and hand sharpened by hanbon forge. The full tang blade has been constructed from 1095 high carbon steel. The steel has been throughly refined and tempered, A special clay is applied to the blade by hand, using a thin covering near the edge and a thicker layer over the rest of the blade. this results in a relatively quicker cooling of the edge during quenching, producing a hard edge and softer back. the beautiful real hamon on the bla.. 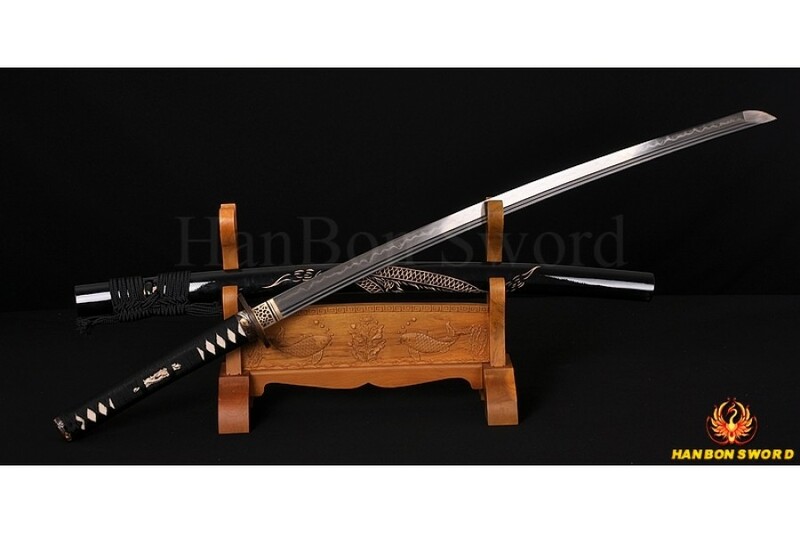 This Katana sword has been hand forged using the ancient method of sword making. 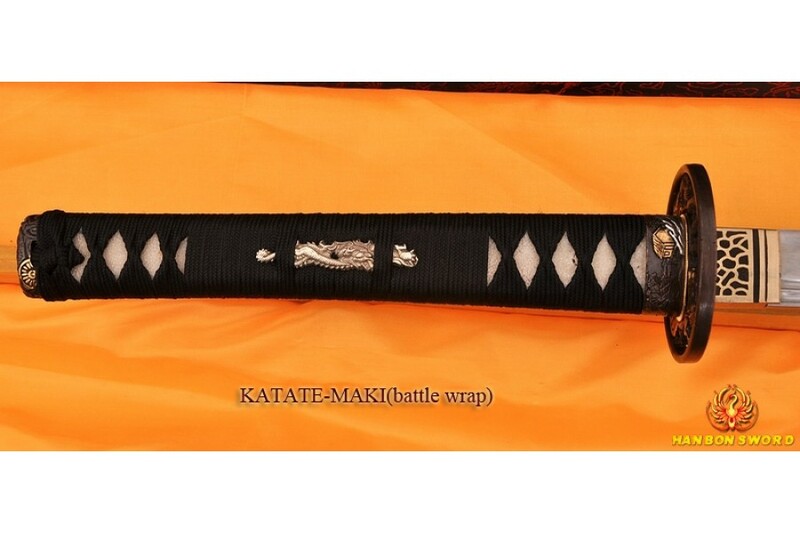 The blade of the sword has been constructed from 1095 High Carbon steel in a Maru style. In accordance with Japanese tradition, the blade has been treated with a clay covering, applied to the entire sword except the cutting edge. The blade is heated and quenched in spring water. The combination of the quenching and the clay cover creates a significant temperature difference in the Ha of the blade and the rest of the.. 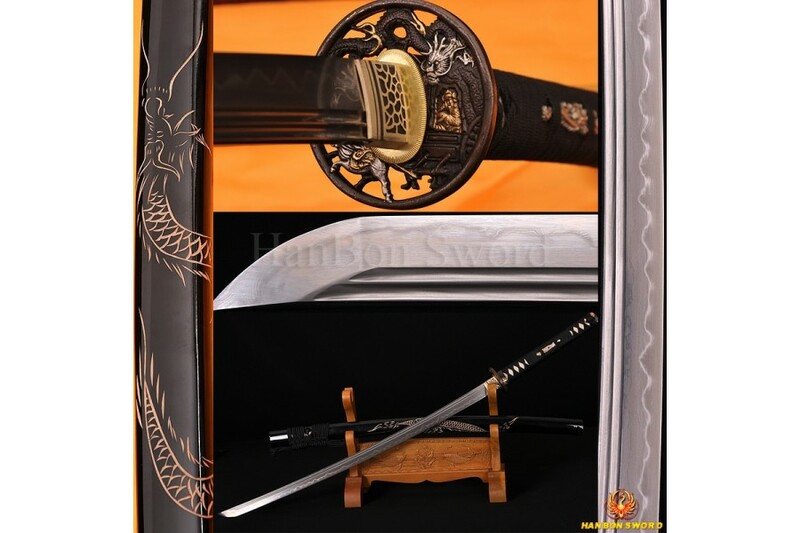 This Katana sword has been hand forged using the ancient method of sword making. 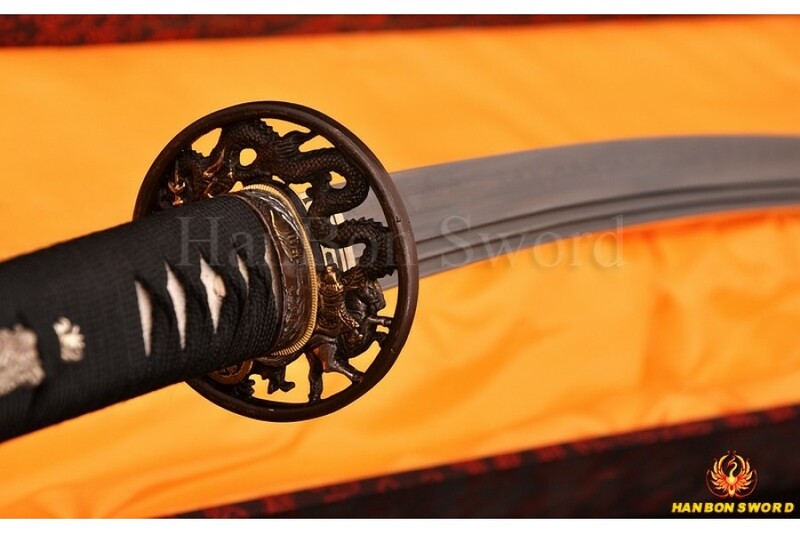 The blade of the sword has been constructed from 1095 High Carbon steel in a Maru style. A special clay was applied to the blade by hand, using a thin covering near the edge and a thicker layer over the rest of the blade. this results in a relatively quicker cooling of the edge during quenching, producing a hard edge and softer back. the beautiful real hamon on the blade was also result of the differential cooling o..